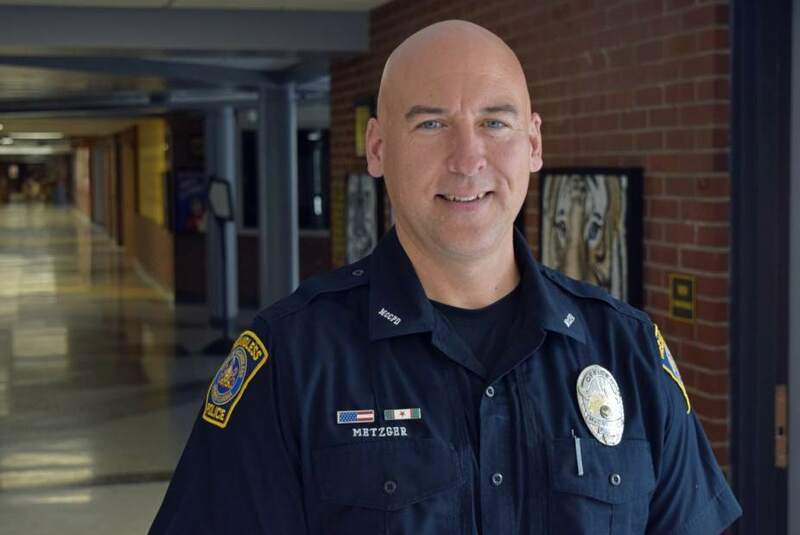 You probably see NAI’s School Resource Officer, Mike Metzger, around the halls, but perhaps you don’t know much about him or why he’s in the school. Mike Metzger has been police officer for 25 years. He worked in City of Pittsburgh for 10 years, and he has worked here in McCandless for 15 years. He also served in the Navy while he was a taking community college class in Virginia. “I dealt with law enforcement, and that’s when I knew I wanted to be a police officer” Metzger said. He has two kids of his own, and he has always handled kids getting into trouble with the law. That’s why he volunteered to be NAI’s School Resource Officer. By volunteering, he wants to try to lead the students down a better path to better behavior, and he says he enjoys what he does for a living. “I believe that I can help some kids that are having issues with their behavior”, Metzger explained. On a normal school day, he starts work at 6:45 a.m.., where he monitors the students getting off the bus until school starts. Then he goes to the office where he finds if there are any issues throughout the school that need to be addressed. He says that he has meetings with the administration or the guidance counselors to see if he can assist in any way. And now that he is a new School Resource Officer, Metzger takes a Security-and-Safety Assessment of the school where he addresses physical issues throughout the school to make it safer. When you see Mike Metzger in the halls, he wants you think of as him as a “safety blanket”. He wants students to feel that they can come to him for assistance with any problem. Metzger says he has an interest in, not only the school and in the community, but in the students in general. Not only does he volunteer on protecting our school, but he has also volunteered to coach in slow-pitch softball. He coaches 7th and 8th grade girls for North Allegheny where his daughter plays on the team. He also says he has lots to contribute to the school district. When it comes to crime in McCandless that most citizens don’t see, Metzger says there are lots of cases revolving around retail theft and other robberies such as people breaking into cars or stores. However, he says mostly all the crime around this area is driven by drug addiction where criminals rob stores or houses to get money to support their habits. Metzger also believes that all schools in North Allegheny should have a School Resource Officer. He also explained that by having a School Resource Officer in every school, it would help students learn the difference between right and wrong , and what could happen if they make a bad decision. According to Metzger, by having a School Resource officer in elementary school, the children can think of the officers as friends and as role models.